Nature is at her loveliest in the Gangtey/ Phobjika Valley that is a glacial valley (a glacier flowed here centuries ago and carved the valley into this unique shape) shaped like a bowl near the Black Mountain national park. This is an attraction that you can see during your entry or exit from Bumthang as the valley is in Wangdue district. Naturalists and photographers love the Phobjika because of the flocks of black necked cranes who dwell in this high-altitude valley (3000 m). Besides the famed black necked cranes, you can observe Himalayan Serows, Yaks, Sambar Deer’s, barking deer’s and foxes amidst luxuriant trees of pines, maple trees and birch trees. The valley has rich growth of dwarf bamboo that serves as food for the cranes. You will enjoy this place if you crave immersion in nature and want a break from modern life as there is limited mobile and internet connectivity here. The quaint villages of Gangtey, Phobjika, Beta, Kingthang etc. dot the valley. 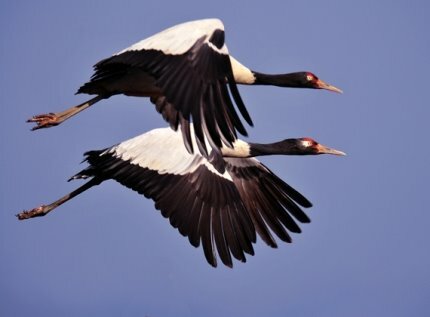 The migratory Black necked crane (Grus nigricollis); the star of Gangtey/ Phobjika Valley is lovingly referred to as Thrung Trung Karmo and many songs and stories about it exist in Bhutanese folklore. These endangered birds migrate from Tibet at the advent of harsh winters (October) and stay in Phobjika till Mid-March. There is an information center complete with spotting guide, literature and high powered telescope dedicated to these cranes that is situated on the main road of Phobjika. The valley runs on eco-tourism so maybe you could help it by buying some products from the small gift shops that dot the valley. The ride or journey to Gangtey/ Phobjika will not be easy whichever route you may take. But its rather fascinating to view the vast undisturbed flat valley after rough mountainous jungles. There are two rivers named Gay Chhu and Nakay Chhu flowing through the valley and locals say that they represent a rival snake and a boar. The most convenient option of reaching Gangtey is by hiring a cab from Paro/ Thimphu/ Punakha/ Wangduephodrang. If you are travelling from Paro or Thimphu then stop in Punakha for one day and then drive to Gangtey. From Thimphu to Phobjika the distance is 125 km and the cab fare is 2278 NU. Many people drive on to Phobjika and Gangtey Valley after visiting Wangdue. The distance between these two places is 17 km and the taxi fare is 500 NU. If you directly want to visit Gangtey/ Phobjika from Phuntsheoling then the cab will charge you 5200 NU for 280 km. From Trongsa to Phobjika, the distance 84.3 km and the cab fare is 1480 NU. If you want to approach Phobjika from Bumthang then you have to cover distance is 163 km and the cab fare is 3021 NU. From Paro to phobjika valley the distance is 166 km while the cab fare is 3078 NU. From Thimphu bus terminus, a 25 seater bus runs to Phobjika every Thursday and Saturday (starts at 9 a.m. and reaches at 3.30 a.m.). From Wangdue, there is a daily bus which runs to Phobjika every day (starts at 2.30 p.m. and reaches at 6.00 p.m.). To reach the beautiful valley of Gangtey/ Phobjika, from Paro/ Thimphu/ Wangdue/ Punakha you need to avail a road cut just 3 km before the Pele La Pass. Drive towards the Lowa La that is at an altitude of 3360 meters. The entire scenery begins to be dominated by dwarf bamboo shrubs and potato fields and then it’s an indication that you have reached Gangte village. Once inside the valley, almost no local transport options are available and you must walk a lot (the scenery is so beautiful you won’t mind it). There are many religious and natural attractions in this valley but they can be covered in a maximum of two days. If you arrive in October-November, you will be mesmerized by the cranes and other migratory birds. There is a dearth of local transport options inside the valley and tourists/ locals actually walk everywhere on foot. If you have a problem with so much walking, then do retain a taxi and driver. Alternatively, your hotel will arrange this for you. However, the principal charm of the Gangtey/ Phobjika is in its nature trails and if you cannot walk around …. there is not much point of the visit. This majestic monastery stands on the west of the black mountains and overlooks the U shaped Phobjika Valley (45 km from Wangdue Phodrang). Not only is the 17th century Gangtey Gompa an important tourist attraction, it’s also a major religious seat of the tradition of Pema Lingpa. The beautiful monastery lies in the village of Gangten in the Valley of Phobjika. It is said that the flock of migratory black necked cranes circle the monastery 3 times on arrival and 3 times on departure to Tibet. The origin of this monastery dates back to the 8th century when Guru Rinpoche established the Vajrayana School of Buddhism in Bhutan. The Guru unearthed many treasures of ancient Buddhism and passed on them to his incarnation Pema Lingpa. It was Pema Lingpa who saw the loveliness of Phobjika against the rugged mountains and predicted that his descendants would build a monastery here. His prediction was fulfilled by his grandson Pema Thinley in 1613 and then expanded by his great grandson Tenzing Dhendrup. The original name of the Monastery was Gangteng Sang Nga Choling (Summit to Teaching of Dharma). From 2002 to 2008 , a sum of 700 million was used for reconstruction and glorification of this monastery. Presently the monastery has 104 pillars that are painted with dotshoen mineral paint, a large central gompa and quarters of the monks. The central hall is built in Tibetan style with 18 beautiful pillars and is the biggest hall in Bhutan. The inner sanctum contains the chorten which has remains of Tenzing Dhendup. The remains of 6th Gangte Trulku is kept on the first floor. The monastery has some pretty gory contents like the hand of a British officer that had been severed in the British Army Bhutanese Army Deothang war. There are two festivals that happen in the courtyard of this Goempa; the Gangtey Tsechu and Black Necked Crane Festival (for details visit the Bhutan Festivals Page). This is sharp, vertical and pristine white building to the north of the Gangtey Gompa. The Kuenzang Chholing hosts 300 student monks and is an important Buddhism knowledge dissemination centre in this region. The young monks are quite friendly and you will see many of them playing with marbles in the building courtyard in their free time. There is a dirt road which reaches the Kumbhu Lhakhang from Kuenzang Chholing shedra in 10 minutes. This is a protector chapel and a beautiful meditation retreat that will instantly calm your soul. The retreat is dedicated to the local God Sipey Gyamlo. Incidentally the word Kumbhu means 1000 statues. If it’s raining, don’t take the dirt road…its treacherous. This pretty little chapel is situated to the south of Tabiting on the western side of Phobjika. The road winds past the settlement of Yusa to this old chapel (supposedly the most ancient in this area). Inside, you will see beautiful thangkas and wall paintings. A good place to meditate. Open between 9 a.m. to 5 p.m. The RSPN or Royal Society for Protection of Nature’s is responsible for protecting the exotic flora and fauna reserve of Gangtey/ Phobjika. It is the RSPN which runs the Black Necked Crane Information Center. The center has very powerful array of bird spotting scopes and is an excellent place to learn the art of bird watching. You should also go through its detailed pamphlet “The Field Guide to Crane Behaviours”. The Black Necked Crane Information Center doubles up as a provider of homestays and bikes (NU 700) and hiking guides (NU 500). There is a library, handicraft shop and some interesting videos which you can watch. If the stories and lore’s of Bhutan enthral you then this seemingly nondescript chapel should be on your visit list. This is one of the 8 residences of 14th century Dzogchen Master Longchenpa. Inside the chapel, you will see friendly monks who will show you beautiful relics and narrate tales of kings and Gurus. If the resident head monk is a good mood, you will be blessed with an Old Thangka (supposedly it has blood stained handprints of Longchenpa). Other objects worth seeing are statues made by Longchenpa, fossil of an elephant’s tooth, holy skillet made by Pema Lingpa. There is another chapel nearby which has a rather alarming portrayal of Rahula (local deity) who has 9 heads, a snake tail and is covered with eyes. Don’t miss walking up to the gigantic cypress tree (supposedly originating from the walking stick of Longchenpa) and the sacred fountains at the hill base (fill up your drinking bottle with the fresh mountain water). Most people who come to Gangtey/ Phobjika do a lot of hiking and bird watching. For hikers, there are several options ranging from easy to tough and the scenery is invariably rewarding. The easiest trail to attempt is the rather well known 90 minute Gangtey Trail. This trail commences at the Mani stone wall that lies on the northern side of Gangtey Goemba and goes on till the Khewa Lhakhang. On the way you will see beautiful foliage and can also catch a glimpse of some birds. You can choose to start a more difficult hike from around the Black Necked Crane Information Centre and then walk to the interesting Beta Village which has several handicrafts and a local school (kids are always delighted to see tourists bearing candy) and then proceed to the Gangtey Goemba. Then you must follow the same path used by Gangtey Nature Trail and pass through the village of Semchubra. You will walk through lichen overgrown fragrant pine forests and then reach the Kingthang village where there is a temple built by the Queen mother. From here if you wish you can proceed to Yusa village or go back to your hotel. The total approximate distance covered would be 13 km. You can opt to follow the hiking trail used by residents of Sha Ngawang and Chitokha when they migrate to and fro from their summer homes to winter homes in Gangtey. Some say that the Gangtey Truelku used to follow this trail. It’s about 6 hours of light walking and your aim will be to reach the Kheylaykha from the Phobjika. This trail is perfect for ornithologists as on the way there are supposed to be many bird sightings. The total distance travelled would be around 11 km. If you want a more difficult hiking trail, then do opt for the Khotokha trail. In 4 hours, you can reach Khotokha though the terrain is a little rough and you will be moving through forests. You can spot some birds and then move to the monastery which has 100 monks living in it. The plan is to walk back to phobjika covering a total distance of 15 km. This is a beautiful 17th century temple dedicated to the war glories of an ancient king. There is a huge collection of knives, helmets, shields etc. that have been preserved in the temple. There is a quaint idol of a local water spirit who used to dwell in the local river. You can get a future reading done by the resident monk after you roll the dice kept in the chapel twice. Watch out for the 5 different versions of Radrap (war deity) who is worshipped by army men, police and armed forces. Gangtey and the Phobjika Valley are regions where you will get low variance in accommodation options. On one hand, you have few luxury hotels and on the other there are some mid quality hotels while homestay/ farm house retreats are also on offer. Gangtey is not on the same scale as Thimphu or Paro and it is even less touristy (if you know what I mean) than Haa or the region surrounding Wangdue. Most hotels in Gangtey and Phobjika (except the few luxurious ones) do not accept cards so make sure that you carry cash. The Amankora Luxury Lodge in Gangtey has 8 suites and is perched on a beautiful forest clad knoll that commands a sweeping view of the floor of the Phobjika Valley and the ancient Gangtey Goempa. The Amankora is in perfect balance with the wildlife reserve Wangchuk National Park (which it borders), that is home to more than 300 endangered black necked cranes. Each suite has king sized beds, a traditional Bukhari (wood burning stove), stylish Banquette window seats. Bathtubs clad with Terrazzo and double vanities. There is a luxurious separate shower area with fancy fittings. It’s advisable that you arrive at Amankora before dark so that you can appreciate the wonderful scenery. Don’t miss the gigantic floor to ceiling windows in the common dining and seating area as they offer stunning views and a perfect setting for a relaxed cup of coffee or a glass of champagne. The Hot Stone Bath facilities at Amankora are commendable and you can see the whole valley before you as you soak in your bath. There are facilities for visiting the local school (make sure that you carry along candy) and having an intimate candle light dinner. There are two options of walking trails; the easier walk past farmhouses, schools and fields and the tougher one past Langtey Valley. The service is excellent and you will get trained guides for hiking and sightseeing tours while bikes are arranged for biking trails. Go for Room number 4 in the Gangtey Amankora…it has a mesmerising view. The tariff is steep with 1550 USD per night excluding 20% tax. However, in house drinks, meals, pick up and drop are included in the tariff. This is an upcoming luxury resort that has recently opened its doors in 2017. The Six Senses celebrates the concept of all the six senses in the human spirit and presents a sensual, decadent living atmosphere to guests. There are only nine rooms here which makes it a boutique luxury hotel. The Dewachen Hotel stands amidst apple orchards and beautiful gardens while the backdrop is a luscious blue pine forest. The Dewachen has 16 well furbished rooms which are fusions of traditional architecture and modern comforts. The rates for single rooms is 3300 NU and the rate for double rooms is 3800 NU. All rooms have individual balconies which command a sweeping view of the valley. Like most hotels in Bhutan, there is a hot stone bath facility and there is also a nice-looking cocktail lounge. The hotel has a smallish conventional hall so it can easily host a mid-sized business convention. The rooms have traditional hot stoves and beds have hot water bags (a rather quaint touch!!) and the rooms speak of a cozy charm. However, in the winters it will get a little too cold if you don’t ask for an electric heater. The biggest disadvantage of the resort is its lack of central heating. Other issues are no Wi Fi and faltering electricity (Phobjika and Gangtey have seen electricity only since 2002). However, there are nice touches like the concept of communal dinner around a traditional wood burning stove and woven bed spreads on the beds. There is an in-house restaurant at Dewachen which serves Bhutanese, Chinese, Continental and Indian food. The hotel aids with treks to monastery, Phobjika Valley and arranges day walks. If your primary purpose of visiting the serene Phobjika Valley is spotting the Black Cranes, then this should be your chosen accommodation option. The Gakiling is a rather basic hotel minus the frills but if you are looking for comfortable amenities then most of your expectations will be fulfilled. The USP of the hotel is its location, right in the heart of Phobjika Valley and a little further up than the Black Crane Information Centre. For photographers, ornithologists and nature lovers there cannot be a better location as you can basically see the whole valley from the hotel windows. The rooms are furnished in a comfortable though not luxurious way and are wood panelled with electric radiators. The clean and spacious rooms do not have a phone or TV (if you cannot live without either don’t come here!!). The service is rather charming and the staff will supply you with books galore to compensate for the lack of wi fi. The rooms are kept quite warm and there is adequate hot water supply though it takes some time to refill the water tank (this information is important as Phobjika Valley is quite chilly). The hotel claims that it serves multiple cuisines but I did not dare order anything apart from basic Bhutanese fare and the food was reasonably good. Mobile coverage is going to be weak unless you are using a local sim. All rooms have twin beds and if you want a double bed inform the staff in advance, they will join the beds for you. The views from the first-floor rooms are better. When in Gakliing Hotel the most pleasurable activity could be to sit, and look at the Black necked cranes swirling around under the bright cold moonlight. This is a traditional style farm house which has been remodelled to serve as a guest house since 1994. Originally, this house belonged to Gangte Trulku’s (a holy reincarnated Lama) sister so it has a certain ambience and historic value. The wooden floors creak when you walk on them and there is an actual chapel on the second floor. There is a total of 14 rooms (including single, double and twin) and the room tariff ranges from 2200 NU to 3000 NU plus 20% tax. The farm lodge offers an experience to savour the rustic experience of Bhutan’s rural life. The nearby village is a good place to walk around and there are several hiking paths. Ara making and the art of making Emma Datsi can be learnt from the staff of the lodge and they are usually quite friendly and open. This Guest House is a great place to see if the spiritual intensity of Bhutan and the mysticism of the practices of Buddhism draws you. It stands a few meters away from the Gangtey Goempa. For the tourist looking for spiritual immersion, religious knowledge or simply one who plans to do some soul searching will like the place. From the Guest house, you can hear strong chants uttered by the monks during prayer times. All the rooms have room heater and are wood paneled. Food is quite basic and you get Indian, continental and Bhutanese fare. I tried Indian and the dal, curry and hot gulab jamun were nice. There are some issues like there is no wi fi or TV (wasn’t expecting this) and one must inform the staff about bath timings so that they turn on water heating (wasn’t expecting this too). In the evening a bonfire was lit and sitting outside amidst the scenic beauty was nice. By the way, the revenues generated from this guest house goes towards upkeep of the monastery and education of the children. The room tariff is 2760 NU for standard and 3360 NU for deluxe room. This quaint guest house is owned by Dorji Wangmo who us the owner of the Wangmo Hand weaved carpet factory (this shopping option is right next door). Only 8 rooms exist and the tariff is 3240 NU. Funnily, most rooms have bathrooms of varying sizes so maybe you should check 4 to 5 options of rooms to select your preferred washroom size. There is no lift and the stairs leading to the upper storeys are quite steep. On the positive side, all rooms have Bukhari (traditional wooden fire place) and the rooms are pleasantly furnished with pine wood panelling. Another place to stay if your primary goal of visit is familiarisation with the famed migratory black cranes of Phobjika. The rooms are nothing exceptional and the lodge offers very basic amenities. The tariff is (compared to the facilities) high at 3360 NU and its worth staying here only if you really want to view the black necked cranes from the hotel. The food is very mediocre and the staff seems to face communication problems. Hygiene standards of the lodge are usually good. No touristy restaurants are available in Phobjika/ Gangtey. Eat your meals at the hotel and pack lunches for your hiking trips. There are couple of shops near Gangtey Gompa selling tea, eggs, wai wai and fruit and these are pretty much what you should expect while walking around. The shops inside the villages might serve some local snacks (most prominent amongst them being momos and beef/pork pieces curried with chillies and spices). Most tourists are there in Phobjika for a day or two so the lack of good dining options outside the hotel doesn’t really matter.